Prince Charming Shower Gel- £4.95 for 100g bottle. Made with marshmallow root, Fair Trade Vanilla & fresh pomegranate juice. Am adding a bottle of this to my cart for sure! Love Locket- £6.95 each. 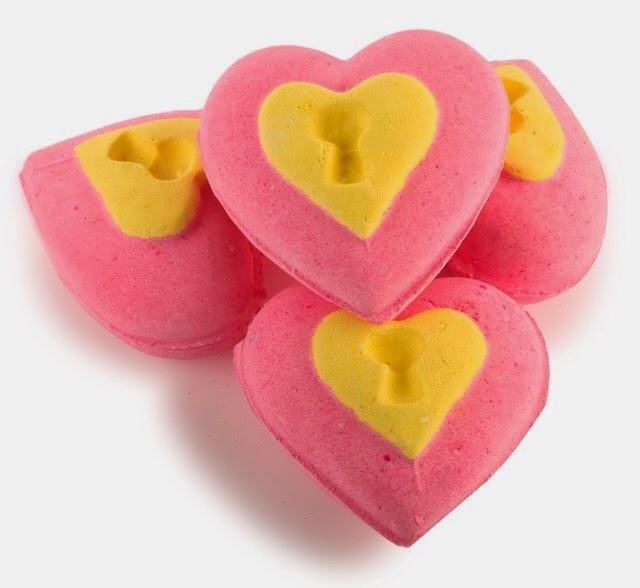 This bath bomb's outer shell has little paper confetti hearts that float through the (pink!) water as the bomb fizzes!! The Kiss- £5.95 for a tub. 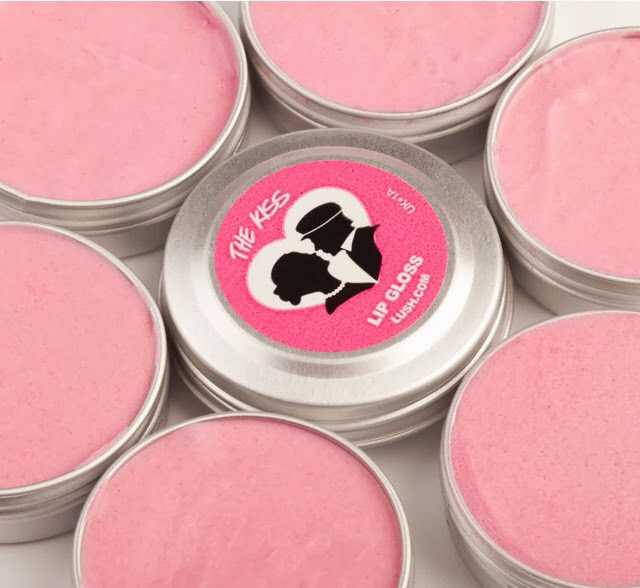 This a moisturising balm that will give lips a pink sheen. 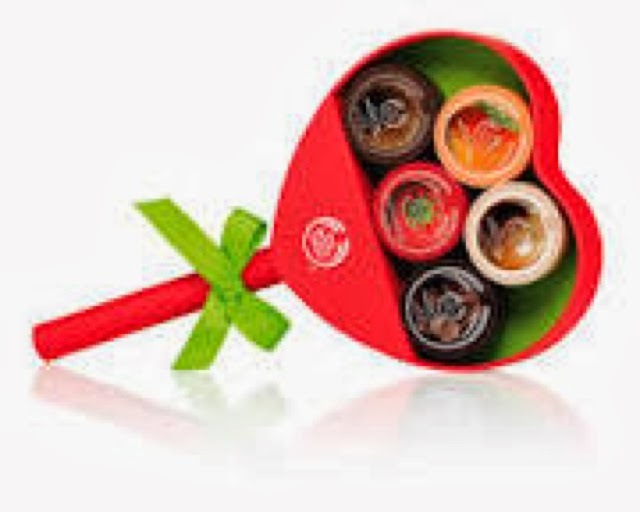 Then we have The Body Shop's offering. They have a few collections ranging in price from €9.95 to €30 & will suit all preferences. First up is their Chocolate & Strawberry Shower Gel Duo that comes in at €9.95. The Body Shop's shower gel is a non-drying, soap free formula that is kind to skin & in these gorgeous scents how could you go wrong?! Chocomania is enriched with cocoa butter (wonder worker for dry skin!) and Fruity Strawberry has strawberry seed oil. Next is the Born Lippy Heart Tin at a mere €11.95 for 3 top notch lip balms that give a subtle hint of colour. And the tin is so cute!! Finally, Illamasqua are releasing a gorgeous collection in their nod at the Day of Lurrve. The collection, called "I'm the One" included a nail polish, a lip liner, a lipstick and a lip gloss, all an intense red shade. image is from the British Beauty Blogger's site HERE! I know I will be getting my hands on the gloss that is for sure...intrigued by the lip liner too... anyone reading ever try Illamasqua's lip liners? So, what products are popping out at you? I am not big on the whole Valentine's Day craic as in my opinion you should spread the love everyday but I am a big fan of the pretty products! Beautiful ideas! *_* <3 I love The Body Shop set! Your blog is amazing! :) I'm a new follower.. I'd be happy to have a new follower like you! Hope you will check out my blog! Lovely picks...you have to get yourself into a lush store stat...they're fab!